The herb garden behind the Geffyre Museum looks, with its artful foliage arches and dense herb beds, as if it has been around for a couple of hundred years. In fact it’s a relatively new creation, planted as a homage to the area’s now vanished market gardens. Liqueur specialists Sweetdram used herbal inspiration from the Geffrye for their pop-up sited in the garden. On a balmy August evening Eat Hackney, her mum, dad and brother sampled cocktails, while other guests strolled the walkways, played Connect 4 on the lawn and enjoyed one of the borough’s more mellow green spaces. Sweetdram are the creators of Escubac, a modern liqueur distilled in antique copper stills in the Loire Valley in France using fourteen aromatic botanicals, including caraway, cardamom, nutmeg and citrus. The cocktails served at the Geffrye blended Escubac with cherry, lavender, rum and other delicious ingredients. Salut and merci to Sweetdram for their leafy summer event, and for recipes for their bespoke beverages Strawberry Fields and Peach Mitchell. And look out for the Gimlet Bar pop-up here in September, when more leafy infusions and esoteric brews will be on the menu. Pour the Escubac, rum and lemon over ice, stir and top with cola and finish with a single basil leaf. Use scales to weigh the dry and wet ingredients. Put all dry botanicals into a cast iron pot. A heavy lid is important to trap moisture and maintain consistency, and cast iron is good for even heat distribution. Slice the peaches into segments and remove the stones. Dice the apricots and add them. Add the sugar and wet ingredients and stir to homogenise. Turn on a very low heat and allow the syrup to be brought to a simmer. Cook for approximately 1hr 15m or just before the fruit begins to stew. Remove from the heat and allow to cool. Filter through muslin cloth. Dilute at a ratio of 16:80 syrup to spring water. Use still water if you have a soda stream or a sparking water with a good bubble count if not. Use the scales again to balance the mass ratio. Pour all the ingredients apart from the prosecco and soda into a large wine glass and top with ice. 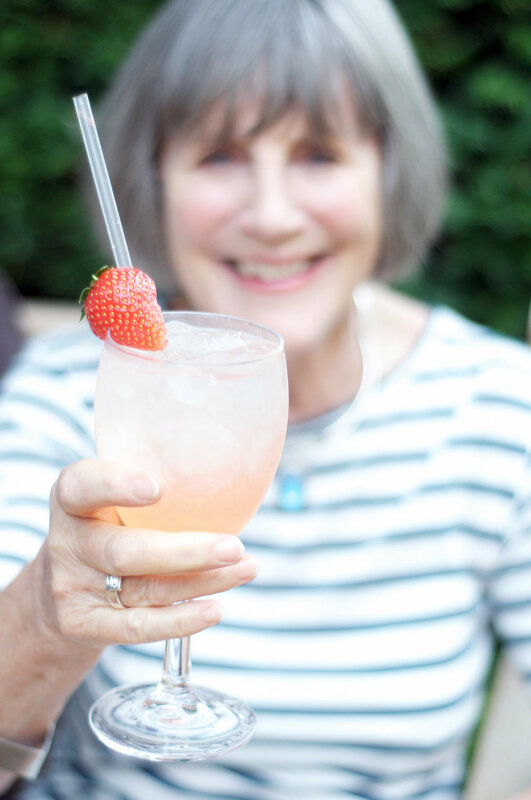 Pour over the prosecco and finish with a splash of soda and a strawberry to garnish. *To make the strawberry Fino: cover two cups of chopped fresh strawberries in four cups of white sugar and leave for twelve hours in a large, sealed container. After another twelve hours, pour 70cl of Fino sherry into the container with 1 vanilla pod. Leave for a further twelve hours to infuse before double-straining the resulting mix into a clean, sealable container. The Fino should keep refrigerated for three to four weeks.